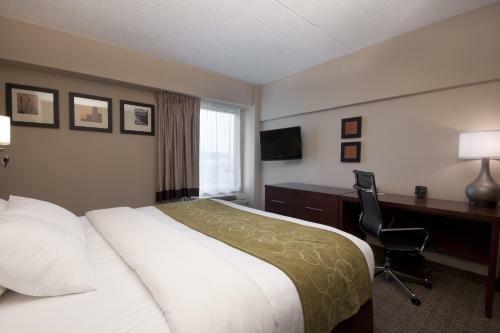 Our guests can look forward to a free airport shuttle business center free breakfast and a non-smoking environment at Comfort Suites at Woodbridge - Avenel located 18 minutes from Newark Liberty International Airport. The seven-story hotel's 101 newly renovated suites offer pillowtop mattresses desks microwaves mini-fridges coffeemakers and cable TV with HBO. Some suites have jetted tubs and wet bars and local calls and Wi-Fi are free in all rooms. 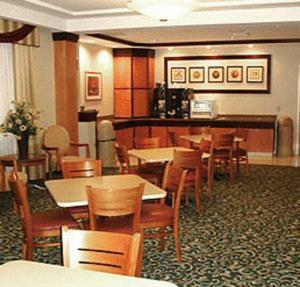 Guests can fuel up for a day of sightseeing or business with the hotel's free hot buffet breakfast. A business center and fitness room set the stage for working or working out. The hotel also provides free weekday newspapers and free coffee a guest laundromat free airport transportation and parking. 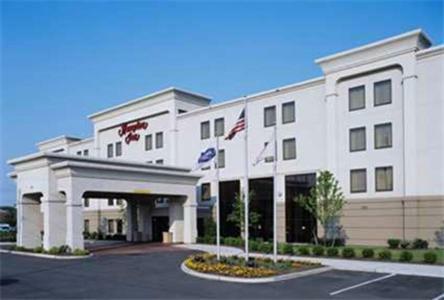 Located off Route 1/Route 9 South the hotel is a mile from downtown Avenel and 30 minutes from New York City. Shoppers can head to Woodbridge Center Mall located four miles from the hotel or Menlo Park Mall which is five miles away. Other local options include harness racing at Meadowlands Racetrack and exploring Liberty State Park both within a 30-minute drive. The New Jersey Performing Arts Center and the Prudential Center both within 25 minutes' drive host various performances. It's less than 10 miles to Newark Liberty International Airport.